Update: To those of you heading here looking for iPad 2 comparison, check out our new chart! The price of the Motorola XOOM has been quite the topic of discussion over the last couple of days so we thought we’d drop some additional information into the conversation. 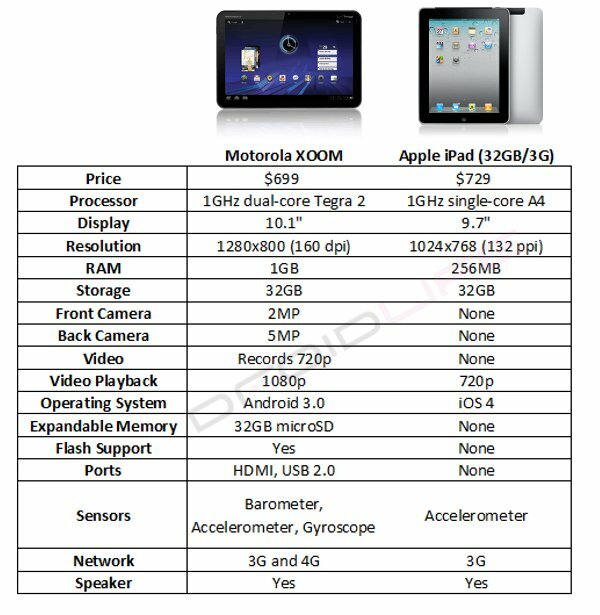 Here is a comparison chart of the XOOM ($699) to the 32GB 3G iPad ($729). Yes, we actually compared it to the version of the iPad that matches up closest rather than to the $499 Wi-Fi-only model that so many keep referring to. This battle isn’t even close. Chart after the break. Looks like a steal to me. And yes, consumers do care about tech specs. Update: Why would we not compare this to the iPad? It’s the leading tablet on the market. Normally when you do comparisons, you find the top product on the market and see how yours stacks up. Some of you people are silly. When the iPad2 comes out, we’ll make another chart. We’ll also do charts for the G-Slate, the Toshiba Tab and the Galaxy Tab 2. Chill.